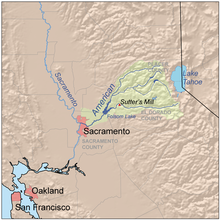 The South Fork American River is a major tributary of the American River in El Dorado County, California, draining a watershed on the western slope of the Sierra Nevada east of Sacramento. The river begins in pristine Desolation Wilderness and flows through the Sierra Nevada foothills. The river at Coloma was the site of James Marshall's discovery of gold at Sutter's Mill on January 24, 1848, which started the California Gold Rush. The South Fork of the American is "the most popular recreation stream in the West" for whitewater rafting in North America, e.g., 80,000 visitors in 2011. The river begins at Nebelhorn near Johnson Pass about 10 mi (16 km) south of Lake Tahoe. From there it flows west for 87 mi (140 km), past the towns of Kyburz, Pollock Pines and Coloma, before emptying into Folsom Lake, the reservoir formed by the Folsom Dam. The North Fork American River also flows into the lake, and the combined rivers form the American River proper, which flows from the dam southwest to a confluence with the Sacramento River. The South Fork drains an area of 840 sq mi (2,200 km2), or about a third of the 2,150 sq mi (5,600 km2) American River watershed. Major tributaries include Silver Creek, Rock Creek, Weber Creek, and Silver Fork American River. Most of the watershed consists of high, forested mountains and steep-sided valleys that receive up to 40 in (1,000 mm) of annual precipitation, except for the westernmost section which consists of drier foothill country. The river also contributes about a third of the total outflow of the American River system. Map of the American River system. The South Fork flows due west from El Dorado County into Folsom Lake near the bottom of the watershed. According to a U.S. Geological Survey stream gage at Lotus, about 5 mi (8.0 km) above Folsom Lake, the average discharge was 1,458 cu ft/s (41.3 m3/s) from 1951 to 1995. The highest recorded flow was 90,000 cu ft/s (2,500 m3/s) on January 1, 1997 (see New Year's Flood), and the lowest monthly mean was 86.8 cu ft/s (2.46 m3/s) in July 1977. The South Fork of the American has approximately eight sections of boatable whitewater ranging from class II to class V. The most commonly run section of river is the class III stretch between Chili Bar Dam and Folsom Lake. This 20 mile section is best divided into two days of boating, from Chili Bar to Coloma (Chili Bar) and Coloma to Folsom Lake (The Gorge). Established boating and river rescue skills are required to run this section of river. Those with inadequate river skills can enjoy this section of river by booking a rafting trip with one of the many companies in the Coloma valley. For those wishing to practice their boating skills without having to face the more challenging class III rapids it is possible boat a shorter class II section from Coloma to Greenwood Creek (known as the C-G) . Meandering through the Sierra foothills this 20 mile section of river has a lot to offer. Thanks to the efforts of local communities and advocacy groups the riperean eco-system of the South Fork remains despite the destructive effects of the gold rush and other developments. The river is home to a wide array of flora and fauna such as bald eagles, golden eagles, beaver and river otter. In Spring the hillsides of the upper Chili Bar section are adorned with stunning California poppies and other wild flowers. There are also interesting historical sights on the river such as grinding holes made by the Nisenan people that once inhabited the area and diversion channels blasted out during the gold rush. There is BLM land located off Highway 49 on the way to Auburn from Coloma with great hiking, biking and equestrian trails. Parking and use is free and it is a great way to experience the South Fork of the American River. These BLM managed areas are part of a 20-year joint effort with the American River Conservancy to protect the habitat and beauty of the South Fork of the American River. Accessible via Cronin Ranch, Magnolia Ranch and Salmon Falls the trails are "stunning every season of the year. Winter rains bring lush green landscapes that cultivate spring’s abundant wildflowers. The summer’s golden hills contrast with the oak woodlands that lead you through fragrant sage-covered ridge tops. The fall colors reflecting against the river take one’s breath away. The trail represents the foothills’ various healthy ecosystems including grasslands, oak woodland, chaparral and riparian habitats. The trail is a wonderful place to retreat and reconnect with nature." . There are two dams on the South Fork proper: Slab Creek Dam, which forms Slab Creek Reservoir near Camino, and Chili Bar Dam, located north of Placerville. Both are run-of-the-river dams serving mainly for hydroelectricity production. Other major dams in the South Fork basin include ones at Union Valley Reservoir and Ice House Reservoir on the Silver Creek drainage. Most of the dams and reservoirs in the basin are operated by the Sacramento Municipal Utility District (SMUD) as part of the 688 megawatt Upper American River Project and Pacific Gas and Electric as part of the Chili Bar Project. ^ a b c "USGS Gage #11445500 on the South Fork American River near Lotus, CA: Monthly Streamflow". National Water Information System. U.S. Geological Survey. 1951–1995. Retrieved 2013-04-14. ^ a b c "South Fork American River". Geographic Names Information System. United States Geological Survey. 1981-01-19. Retrieved 2013-04-14. ^ "South Fork of the American River". The American River: California's favorite whitewater river. Retrieved 2013-04-14. ^ McHugh, Paul (April 11, 2011). "California whitewater rafting: Season's on for 2014 (drought or not)". San Jose Mercury. Retrieved December 2, 2018. ^ Branan, Brad (April 22, 2017). "Record snowpack makes for wild whitewater rafting on American River". Sacramento Bee. Retrieved December 2, 2018. ^ USGS Topo Maps for United States (Map). Cartography by United States Geological Survey. ACME Mapper. Retrieved 2013-04-14. ^ "USGS Gage #11445500 on the South Fork American River near Lotus, CA: Peak Streamflow". National Water Information System. U.S. Geological Survey. 1951–1997. Retrieved 2013-04-14. ^ "SMUD projects awarded grants totaling nearly $6.5 million to advance hydropower technologies". Sacramento Municipal Utility District. 2012-09-12. Retrieved 2013-04-14.